Alachua, Fla. — Careers in Construction Month is gaining momentum with 24 states already proclaiming this nationwide celebration of the career opportunities in the construction industry. Founded by NCCER and its Build Your Future (BYF) initiative, Careers in Construction Month occurs every October to increase public awareness and inspire the next generation of construction craft professionals. BYF has had a record breaking year with the following states already proclaiming: Alabama, Alaska, Arizona, Arkansas, Colorado, Florida, Georgia, Guam, Hawaii, Illinois, Indiana, Louisiana, Michigan, Mississippi, Nevada, New Hampshire, New Mexico, North Carolina, Oklahoma, Oregon, Pennsylvania, South Carolina, South Dakota and Virginia. Throughout the month of October, schools, contractors and organizations partner locally to host events and activities that introduce students to rewarding construction careers. To kick off the month long celebration, BYF will unveil its new mobile-friendly website which is home to their signature craft trading cards, an upgraded and printable construction career path as well as a section devoted to Careers in Construction Month. A number of resources will be located on the Careers in Construction webpage from suggested community activities to methods of working with local television and radio stations. Each guide is embedded with implementation samples to make celebrating even easier. BYF highly encourages organizations to register their events and submit career day photos for additional promotion. Friendly construction-related competitions will also take place on BYF’s Facebook page where winners will be awarded prizes for their participation. In addition, for the third year, NCCER and BYF are hosting the “I BUILT THIS” video contest to give aspiring craft professionals the opportunity to showcase their construction projects. The contest is open through Oct. 23 to students and instructors in secondary and postsecondary career and technical education programs. First-place winners will receive GoPro Hero5 cameras with accessory kits and second-place winners will receive GoPro Hero5 Session cameras. All winners will receive Visa gift cards and BYF merchandise as well. For official rules or to submit a video, visit www.nccer.org/I-BUILT-THIS. 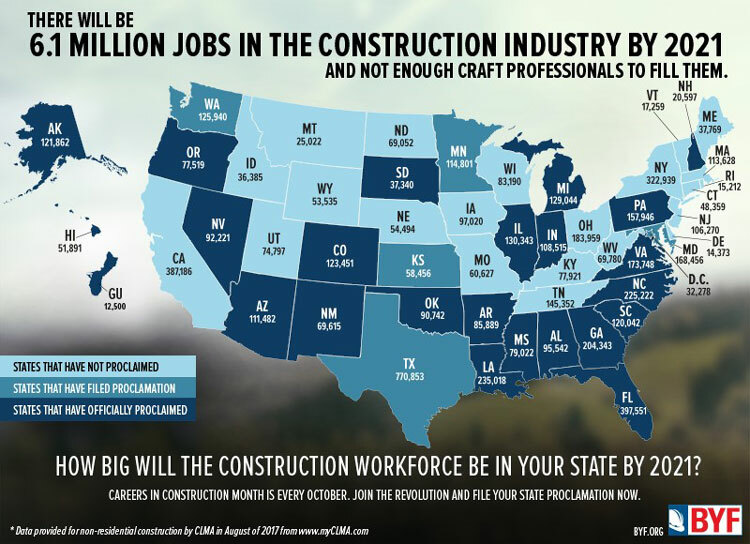 With shortages of craft professionals across the country, now is the time to promote and support construction careers in every state. Take the time to celebrate all the hard working, highly-skilled men and woman who build America and motivate our youth to choose a career in construction. To learn more, visit http://byf.org. For the latest news and updates on career events visit www.facebook.com/BYFcampaign and follow www.twitter.com/buildyourfuture.